Don't take a chance if you don't stand a chance. A drag racing daredevil. Learned his trade blowing up enemy fuel depots in the Asphalt Wars on Cybertron. Armed with two exterior 3000 rounds-per-minute ion pulse guns and magnetic repeller rifle. Also wields mind-altering illusionizer that distorts optic impulses. 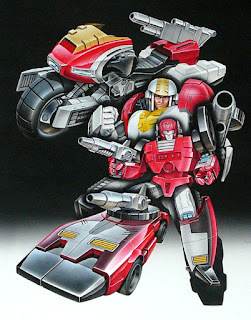 Transforms to rocket car made of rubber-coated armor that deflects and ricochets enemy shell fragments. Outer shell cycle equipped with oil slick and smokescreen ejection mechanisms, retractable tire spikes, hydraulic jumpers in suspension system, and rocket boosters in rear that provide short-term flight capabilities. Combines with rocket car to form super cycle equipped with digital fuel gauges and micronized turbo injectors.